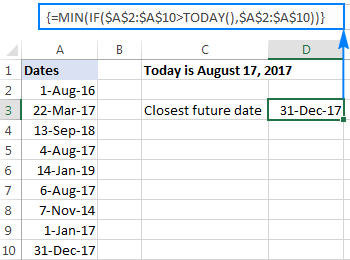 The tutorial shows how to insert today's date in your worksheets and demonstrates a few other uses of TODAY function in Excel. You want to put today's date in some cell? Or you wish to highlight the current date in your Excel calendar? Or you'd like to find the date closest to today? All this can be done by using the Excel TODAY function and this tutorial will teach you how. The TODAY function in Excel does exactly what its name indicates - returns today's date. TODAY() is a volatile function, which means that it updates itself continuously every time a worksheet is opened or changed. If a TODAY formula does not update automatically, most likely automatic recalculation is turned off in your workbook. To turn it on again, go to the Formulas tab > Calculation Options, and select Automatic. To enter today's date in Excel as a static unchangeable value, use these keyboard shortcuts. If you want to insert current date and time, use the NOW() function instead of TODAY(). 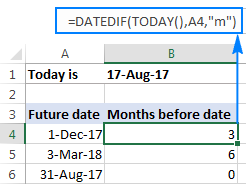 There are two ways to enter the current date in Excel - a formula and shortcut. Which one to use depends on whether you want a static or dynamic value. The value returned by the TODAY function updates automatically, so the below formula is useful if you want the worksheet to always display the current date, regardless of when you open it. Because in the internal Excel system dates and times are stored as numbers, concatenating text with the TODAY() formula directly would result in a meaningless string like "Today is 42965". To avoid this, we nest Excel's TODAY function within the TEXT function to display the date in the desired format. As you already know, the main purpose of the Excel TODAY function is to get today's date. Aside from that, you can use TODAY() in combination with other functions to perform more complex calculations based on the current date. Below you will find a few examples of such formulas. To add or subtract a specific number of days to/from the current date, use a simple arithmetic operation of addition or subtraction, respectively. Tip. To display the calculated date correctly, set the formula cell's format to Date. Tip. If the result is not displayed correct, be sure to apply the General format to the formula cell. For more information about the DATEDIF function, please see Excel DATEDIF - calculate difference between two dates. You can learn a few other age calculation formulas in this tutorial: How to get age from date of birth in Excel. 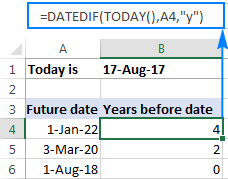 If you are curious to know which date in a list is closest to today's date, use one of the following array formulas to find it out. MIN(ABS(range -TODAY())) part. First, you subtract today's date from each date in the range of dates. Then, the ABS function returns the differences as absolute values without regard to their sign. The MIN finds the minimal value, which goes to INDEX MATCH as the lookup value. ABS(range -TODAY()) part. You subtract today's date from the range of dates and return an array of absolute values. This array is where INDEX MATCH searches for the lookup value. Note. 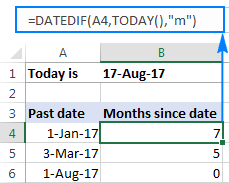 All three formulas to get the nearest date are array formulas, so they should be completed by pressing Ctrl + Shift + Enter. Where B2 is the left-top-most cell of the range to which the rule applies. 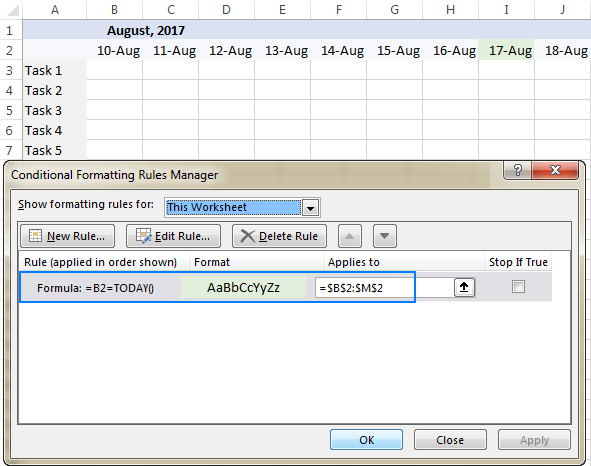 The detailed steps to set up a conditional formatting rule can be found here: How to create a conditional formatting rule based on formula. To have a closer look at the formulas discussed in this tutorial, you are welcome to download our Excel Today's Date workbook. 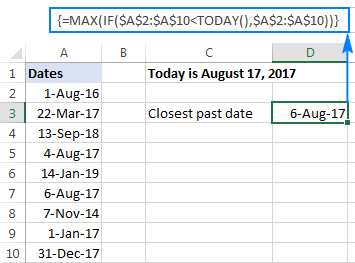 23 Responses to "Excel TODAY function to insert today's date and more"
then copy the formula down the B column. THANK YOU. A million times, THANK YOU!!! can you suggest me a formula, where i need current date in date coloum if i make any change in that particular Row. so if make any change in any details by previous date (6-May-18) should become current date. I believe if you want a cell to update based on change to another cell it requires some code. In this case I think you could use some VBA, but VBA is not in this blog's frame. If you wanted to tackle this you could google "excel update cell if another cell changes". I have a column of dates with some empty cells - how can i fill in all the empty cells with today's DATE? TODAY() will give you today's date. If you enter this function in a cell, the cell will always display the current date. i would like to have a function that when we key in today it will be show date today this date will be not change since we already move to next day..
or When we key in on one cell date today will show automatically. I get "Today is: 25 October 2018 00:00:00" -- and not the current time, no matter what time it is. Even after reading many, many, websites on this topic, I am still confused (or rather, more confused), and I'm not really sure how the time stamp can still be added. I have all the dates for the year in column A starting in cell A2 from 01-Jan-19 through to 31-Dec-19. I used your guidance to create a rule to highlight the current day (thanks). I would like to create a rule so that all of the days that are now past would be in a gray text colour, whereas the current date and future dates remain in a black font colour. Any advice much appreciated. I have the TODAY function in cell A1. I want cell G9 to update to the previous month/year. Ex. Today's date is 1/11/2019 in cell A1 so I want G9 to show December 2018. And then when A1 shows 2/1/19, I want G9 to show January 2019. Does a function and/or condition exist for this? @ Svetlana Cheusheva: Thanks for saving a lots of time. Was wondering if there is a way to have excel change the year of a date entered. For example I enter 5/29 (and I have formatted cells to the 03/14/01 format), so excel returns 05/29/19. But I want a formula so that it returns 05/29/18. So same date just for last year? Thank you very much for your help. Love your name by the way. if i enter in cell name of the task, the other cell need to show the date. Cell A2 =TODAY(), the data in cells B2:G2 fail to move down 1 row to A3 when A2's date is updated. I would also like the formatting from below to automatically be applied to B2:G2 as the new row is created. Thank you.